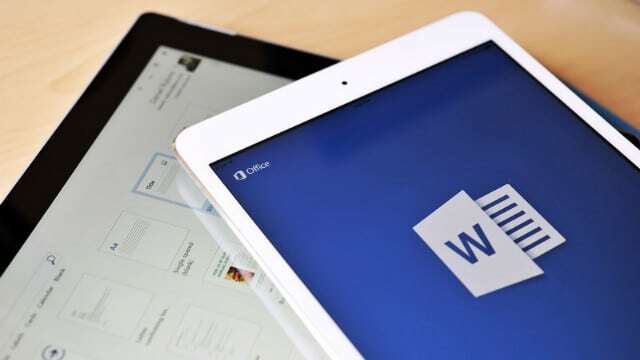 Microsoft released its Office suite for the iPad early last year in an effort to corner the utility software app market on the iOS store. The Office suite for the iPad is essentially collection of three of Microsoft’s most popular utility apps: Word, Excel and PowerPoint. At the moment, you can download and use all three of them for free – mostly. You need to sign in with a Microsoft account if you want to edit or create documents, which is free. However, if you want to save them, you need to have purchased an Office 365 subscription first. These apps, in our experience, work exceptionally well on the iPad’s touchscreen. They are intuitive and easy to handle. They, perhaps, work even better on the iPad than they do on your PC! Microsoft has put a lot of effort into customizing them for the iPad, and it really shows. There are several time-saving features built into these apps, many of which aren’t apparent at first glance. Here are 7 top time-saving tips and tricks for the MS Office for iPad. When you use Excel on your iPad, you know you can double tap on a cell to bring up the keyboard and start typing in data on the spreadsheet. Of course, typing this data again and again is time-consuming. Instead, you can use Excel’s AutoFill feature to repeat the same steps and get the data filled on the succeeding cells automatically. For example, if your data consists of dates (like March 1st, 2nd and so forth), you can use AutoFill to fill up several rows with succeeding dates automatically. To do that, fill in 2 cells with data – it can be any data with an identifiable pattern to it. Next, select both cells at once and bring up the select menu. Here, find the “fill” option and continue the sequence in the direction of your choice, which is horizontally or vertically. Word for iPad is pretty easy to operate with most shortcuts easy enough to figure out. For example, if you want to select a single word in the document, just double tap it. If you want to select an entire paragraph however, triple tap on it. If you want to quickly format your entire document in a certain style, select the “A” symbol on the status bar at the top and choose a text. You can also format different sections of your document in different styles. If a certain part of your document has been formatted in a certain way, you have the option of quickly copying that format for other parts of your document. To do that, select the text with the formatting you want to copy and bring up the selection menu (double tap then hold). On this menu, find the “Copy” option and tap it. Then, go to the text you want to copy this format on, select it, bring up the selection menu and tap the “Copy Format” option. That’s it; you have successfully copied the document format! While you get OneDrive storage with your Office 365 subscription by default, you also have the option of connecting your Dropbox account to it. This means that you can save your Office documents to your Dropbox account or open files on your Dropbox account on your iPad. To connect your Dropbox account to your Office app, tap on your profile picture and tap on “Add a Service”. Find Dropbox and click on it. Alternatively, you can also add Dropbox from the “Open” tab, in the “Add a Place” sub-option. To open a file on your Dropbox account, just tap on it. You can edit any file and have the changes saved back to your Dropbox account automatically. You’ll find the edit icon on the bottom left corner of open documents. We recommend you connect an external keyboard to your iPad if you can to get the most out of your Office apps. Not only is typing faster and easier, you also get access to your favorite keyboard shortcuts. However, the shortcuts are slightly different on the iPad than on your keyboard. For example, where you’d press Ctrl+C to copy anything, on the iPad’s external keyboard you’re supposed to press +c. You can take a look at this official list of Keyboard shortcuts for the iPad (MS Word) to find your preferred shortcuts. While it’s possible to create great presentations on the iPad, we think you should create presentations on your PC if possible. Why? Because on the PC, you have access to hundreds of templates, while the PowerPoint app on the iPad supports less than 20. Also, a presentation created on your iPad isn’t always viewable on your PC – the iOS fonts may clash with your PC fonts, for example, or the text/photos may appear displaced. Making presentations on your iPad with PowerPoint is a dream, on the other hand. You can use Apple’s AirPlay to stream the content on your iPad to big screen TV, Mac or even a PC running compatible software. You can swipe between open slides on your iPad and highlight key elements on them with on-screen lasers. To activate the colored laser tool (a pointer tool), just press and hold on a slide and then drag your finger around. Sometimes you don’t want to preview changes without altering the original docs. You can create duplicate documents, presentations, or spreadsheets on your iPad with just a few taps. Any changes made to the duplicate documents won’t feature on the original. You can, of course, save the changes made to the duplicate document. To duplicate a document (or presentation or spreadsheet), tap the “Open” icon on the status bar. After that, tap the “Duplicate” option. These tips should significantly speed up your Office experience on your iPad. For best results, you should use a computer in tandem with the iPad – it will be faster and you will have access to more options as well. Do you have some useful time savers up your sleeve? Share them with us in the comments below.